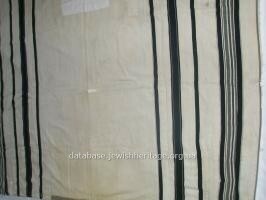 Tallit gadol (large talles) is an element of prayer garment of religious Jews. 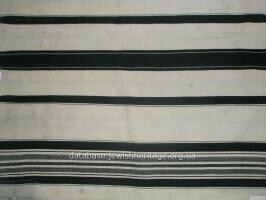 Tallit (or talles) gadol is a ritual garment of pious Jews and is made of white wool cloth as a rectangular curtain with woven black bars of different widths at the edges and tsitsit tassels on the four corners. 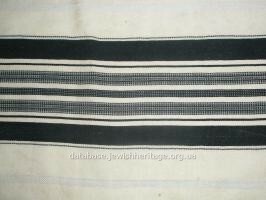 On the top of tallit there is a longitudinal strip of material embroidered with gold threads that is called atarah and serves for distinction of the upper and outer part of tallit from the lower and internal part. Given by T.M. Treibman, the representative of the synagogue in Zhytomyr. 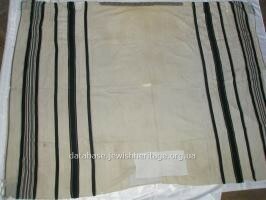 Tallit wearing is the performing of the Torah commandment of symbolizes the submission to the will of the Almighty. 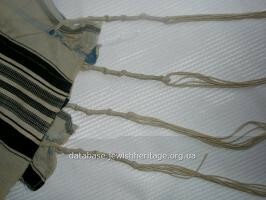 According to Ashkenazim custom the married men wear tallit during morning prayers, and in the Sephardic custom men wear tallit just after bar and bat mitzvah (adulthood). 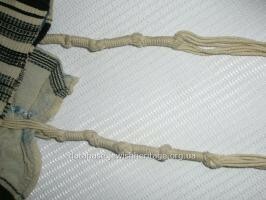 Jewish men wear tallit every day except for Tisha B'Av and Yom Kippur. 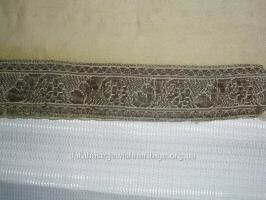 Abrasions, multiple patches, sometimes gaps, damaged golden embroidery, large gap around the perimeter of one of the sides (botched).